Latter-day Saints have worked for almost a century to build the Church and to share the gospel in Florida. Now, in fulfillment of a promise given to members in this area by President Spencer W. Kimball, a temple of the Lord will be dedicated in October in this tropical state. Missionaries first arrived in Florida in 1843, but there is no record of their activities. Two years later, Phineas H. Young, brother of President Brigham Young, spent two months in north Florida, where he gave out several copies of the Book of Mormon to Indian chiefs. But it wasn’t until 1895, fifty years later, that the first large organized missionary effort began. At that time, Florida was part of the Southern States Mission. Missionary work moved slowly in the new area. Missionaries spent winter months in Florida and then moved to the northern part of the mission﻿—Tennessee and the Carolinas﻿—during the summer. As people were baptized, missionaries helped establish Sunday School organizations before they moved on to new areas. The first Sunday School in the state appears to have been organized in Coe Mills in northern Florida in 1894. There was a strong anti-LDS sentiment in the area at the time. However, in the midst of these trials, some good people welcomed the elders. Polly Douberley was one of these. She readily accepted the gospel and helped missionaries teach it to her deaf-mute husband. On 24 April 1897, the Douberleys became the first converts in Florida’s Columbia County. During the 1896 holiday season, two other families were baptized. One of those families moved shortly afterwards to nearby Jacksonville, but the George P. Canova family remained in the area, sheltering the elders and assisting in bringing more families into the gospel. A year later, on January 1, two members of the Quorum of the Twelve visited Florida for the first time. Francis M. Lyman and Mathias Cowley organized the area’s first branch and called Brother Canova as the first branch president. Six months after being called as branch president, President Canova was returning from a conference when he was shot and killed. Although five men were arrested, they were later released. No one was ever convicted of the crime. But members were committed to living the gospel, and the Church continued to grow. In 1947, President George Canova’s grandson, Alvin Canova Chace, was called to be the president of the Florida Stake, the first stake organized in the southeastern United States. It was recognized at the time as the first stake in the east composed mostly of Church members native to an area. Gradually the gospel moved south to Miami, once a frontier town of only two thousand residents. J. C. Neubeck moved from Palatka, Florida, and became the first known Latter-day Saint in the community. In November 1920, historians described the organization of the first Sunday School in the town. “Eighteen people gathered under a cluster of seagrape trees on Miami Beach to organize a Sunday School with Brother Neubeck as president” (Ensign, June 1975, p. 40). A decade later, members were meeting in a newly dedicated meetinghouse. Tremendous growth began as the Spanish-speaking members heard the gospel and were baptized. The first stake in Miami was organized in 1960; today there are four stakes in the Miami region. Other Florida stakes have experienced similar growth as the Church moved through the twentieth century. In 1958, the Orlando Stake was created. A year later it was divided, and the Tampa stake was formed. During the next three decades, the Orlando Stake was split another three times. The Tampa area now has five stakes. On 17 February 1990 their faithfulness was rewarded with the announcement of a temple to be built in Orlando. The temple would serve more than 100,000 members in twenty-two stakes in Florida, as well as in the Savannah Georgia Stake. 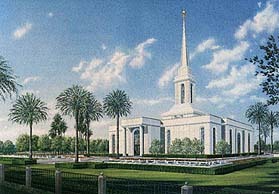 The Orlando Florida Temple now stands as a monument to all the Saints in Florida who have labored so long in the field. Elder Neil L. Andersen of the Seventy, former president of the Tampa stake, says that this dedication will continue to grow. An artist’s rendering of the Orlando Temple, which is to be dedicated in October. Completion of the temple is a long-anticipated blessing to local Saints. Karen Lox Jorgensen is a member of the stake public affairs committee in the Orlando Florida Stake.